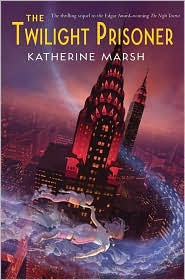 The Twilight Prisoner by Katherine Marsh, is the sequel to The Night Tourist. Jack is back and has now settled into his new life in New York. He is on the Latin Club and has two friends named Cora and Austin. When Jack decides to ask Cora and Austin to hang out, he takes them to a passage way under ground. They meet up with Euri and find out that they may never be able to get out. With Cora's mom sick and Austin on the loose how will these friends find a way to get out. This book is full of surprises that will make you think differently about many of the charaters. This book to me wasn't as good as the first but defineltly complimented the first book very well. With all of the different surprises that make you want to jump out of your seat, it gave the book some seasoning making the whole meal taste even better. Jack also grows so much as a person. He becomes some one totally different by coming out of his shel and taking more risks. This book is interesting and I hope you will enjoy it too.